There's no bulge is there? Nothing going on down there at all. "If you want this back Jefferies, you're going to have to pay." "And people think Stephen Hawking has a big one." Nick Briggs after the accident with the ring modulator, his left cheek and a tube of superglue. The truth revealed - Nick Briggs is a Movellan. Or, "I'm Nick Briggs by the way, run for your life!!!" Nick Briggs, seen here with the object of his affections; "I often take it to bed with me, many is the night I spend time in bed playing with my ring"
After his showbiz career stuttered, Nick took to listening to his police scanner and turning up at emergencies, waving a toothbrush and shouting 'But I was the Doctor once"
"When I'm alone I strap it to my chest and pretend I'm Commando Cody." The breakthrough in Briggs's therapy came when the doctors finally persuaded him to stop answering every question as the Dalek Supreme. Nick Briggs poses at the opening of the new broadcasting region "BBC South V". The new scent from Big Finish. "Man in charity shop jacket marries electronic box." Mr Nicholas Kasterborous Briggs, 41, of Wood Lane, London, today legally married a bit of electronic equipment used for generating Dalek voices. Briggs said that unlike a real woman, he could turn his 'electronic' wife on whenever he wanted, it only spoke when he told it to, and it had been giving him pleasure since 1963. "Ring Modulator Made My Hair Fall Out" claims voice of the Daleks, Nick Briggs. Today on "Nick Briggs Recreates Classic Cliffhangers" we bring you episode 2 of Four To Doomsday. Tomorrow Nick will be dithering around outside a tent, for Greatest Show parts 1. Nick Briggs reinvents the Tardis Tuner. 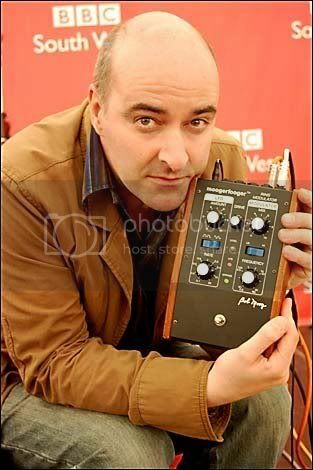 Bald bloke poses with electronic thingy. Man born with electronic device stuck to his chin buys crap jacket. Ring Modulation Monthly's Mr.July proudly shows off his immaculate box. Flood Victim:Nick (57) with the only posession salvaged from his house - "What the f*** am I supposed to do with this? Why couldn't it have been my plasma telly." Actually, I think Nick's more likely to say, "I just grabbed the first thing I could - thank goodness it was the ring modulator and not my plasma telly." "Finger my amazing box and I'll make a funny noise"
Last edited by Simon R; 5th Jul 2008 at 12:36 AM. I was just thinking we could do with another picture when Simon posts a gem!